2 Bedroom Terraced Cottage For Sale in Newquay for Asking Price £275,000. A stunning barn conversion which offers far reaching countryside views and is presented to a high standard. Accommodation comprises lounge, kitchen/diner, cloakroom, 2 double bedrooms and family bathroom. The property is currently being used as a holiday let and has generated in excess of 12,000pa for the last 2 financial years. This unique property needs to be viewed to be truly appreciated and is being sold with no ongoing chain. 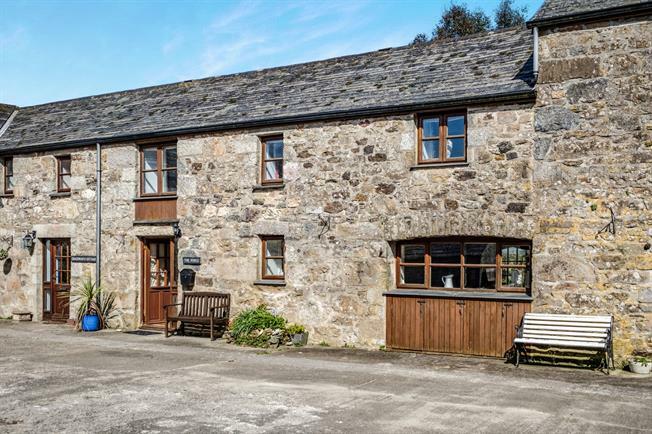 Forge Cottage is accessible via an impressive private lane which leads to the large communal courtyard for this property and the 6 other barn conversions of its kind. Upon entering the property through the entrance door you come into a porch which gives access to the ground floor WC and living room. The living room offers double glazed windows and TV point with a door leading into the spacious kitchen/dining room. The country style kitchen offers a roll edge work surface with a range of base and wall units and inset sink and draining board. Integral appliances include oven with 5 ring hob over, dishwasher, washing machine and fridge. There is an under stairs storage cupboard that provides additional space for a chest freezer. There is a wall mounted combination boiler and there are doors off the kitchen leading to the rear garden. The first floor accommodation offers 2 double bedrooms with the master bedroom offering a built in wardrobe and both bedrooms benefitting from 2 windows which provides ample light. The family bathroom comprises a white suite with a bath with shower over, pedestal sink and WC. The walls are fully tiled and there is a double glazed window with obscure glass to the rear elevation. There are communal grounds surrounding the property and a car park with 2 allocated parking spaces for Forge Cottage. The garden for the property is to the rear and it benefits from being enclosed. It is laid to patio and lawn and offers a garden shed to the rear. The uninterrupted countryside views are the stand out feature of this property and can be enjoyed from every part the rear garden.